You can't choose where on your body you'll lose weight, and you can't choose where you'll gain it, either. However, maintaining healthy fats during weight gain can minimize fat gain in general. Achieving a healthy weight requires strategically adding calories and weight training to help you put on lean muscle, not just fat. Eating more ice cream, processed snacks and soda will cause you to gain weight -- but not the kind you want to preserve your health and fill out your physique. Foods that cause you to gain unhealthy belly fat include sugars, refined carbohydrates and saturated fats. These foods are high in calories, so they could be ones you reach for in an attempt to increase your overall energy intake. Even if you don't seek them out, if you aren't worried about your weight, you may not be diligent about keeping them out of your eating plan. Limit your consumption of soda, white bread, white rice, pasta and baked goods. You may not be worried about the calorie intake making you gain weight, but overconsumption of saturated fats from fatty meats and full-fat dairy can cause visceral fat, which is what accumulates in your stomach, according to a 2014 study published in the journal Diabetes. To gain weight, you must increase your calorie intake daily. If you find you're putting on a lot of fat in your abdomen, only increase your daily intake by about 250 calories per day. 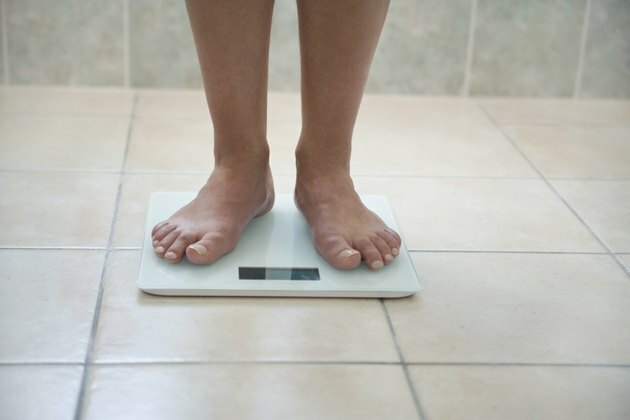 If gaining weight is hard for you, add up to 500 calories per day. Whole, unprocessed foods boost your daily calorie intake and are less likely to make your stomach grow with visceral fat. White bread may be a no-no, but whole grains such as brown rice, dense cereal, 100-percent whole-wheat bagels or bread and wheat germ are calorie-dense and full of quality nutrients and fiber. Eat dried fruit, such as raisins and dates, as snacks, or add extra fresh fruit to smoothies. Good choices include bananas, pineapple and avocado. Nuts are a calorie-dense snack food that you can also sprinkle over salads or cereal and, in the form of nut butter, spread on whole-grain toast or pancakes. Fresh vegetables are often low in calories, but starchy versions such as fresh peas, corn and sweet potatoes offer substantially more energy and contribute to healthy weight gain. Drink low-fat milk with meals and use it to cook hot cereal or canned soup. Opt for hearty servings of hummus with a whole-wheat pita, trail mix, granola and guacamole with corn chips for high-calorie, but healthy, snacks. Strength training and other exercise help you build lean tissue, rather than just pile on fat, when you gain weight. Aim to address all of the major muscle groups, including the legs, hips, back, chest, shoulders, arms and abdominals. If weight training is new to you, use your body weight only at first for moves such as squats, lunges, pushups and pullups, and do just one set of eight to 12 repetitions. As you become stronger, add weight, vary the exercises and increase the number of sets you perform. Work up to doing about three sets of eight repetitions of each exercise; increase the weight once performing eight repetitions seems easy. Cardiovascular exercise, such as jogging or hiking, is still important when you're trying to gain weight. It keeps your heart and respiratory system healthy. Cardio does burn calories, though, so do just a few short workouts per week at a moderate intensity. Healthy weight gain requires planning and diligence on your part. Carry high-calorie, healthy snacks with you in your backpack, purse or glove compartment; snacking or grazing helps you to get more calories all day long. Easy-to-carry snacks include peanut butter and whole-grain crackers or a blend of nuts, dried fruit and whole-grain cereal. Don't skip meals and deny yourself calories. Your body perceives skipped meals as stress, which contributes to belly fat accumulation. Drink milk or 100-percent juice with meals, but avoid filling up so much on liquids that you can't eat whole foods.